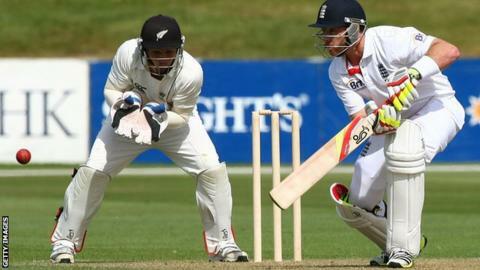 Ian Bell hit an unbeaten 127 as England reached 357-7 on the opening day of their tour match against a New Zealand XI in Queenstown. Captain Alastair Cook made 60 and Joe Root 49, while Jimmy Neesham took 4-65. The tourists showed their intention to persevere with Nick Compton as Cook's Test opening partner by selecting him over Root in that position. The four-day match is England's only warm-up game ahead of the three-Test series starting in Dunedin on 6 March. Bell's innings, which spanned 196 balls and contained 18 fours, helped England recover from 81-3, Jonathan Trott and Kevin Pietersen having fallen cheaply after Compton made 21. Bell and Root, who has made an impressive start to his England career, added 97 for the fifth wicket, before Matt Prior contributed 41 to a sixth-wicket alliance of 80 with Bell. "The two guys up front had the tough time in that first hour - and we got through that," said Bell. "Some of the one-day wickets we've played on here have been absolutely flat, so to play on a wicket a little bit more in the bowlers' favour was a good test." England rested James Anderson and Steven Finn for the encounter at Queenstown Events Centre, with fellow pace bowler Graham Onions included. They are targeting victory in the Test series after their recent one-day and Twenty20 success against New Zealand.